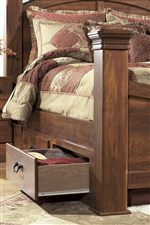 True beauty of country style furniture exemplifies itself in the design of the Panel Headboard Bed with its clean, simple lines, arched top with moulding and decorative fretwork panel. 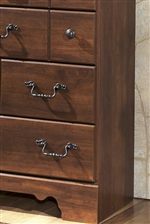 Compatible with Full and Queen size beds, this panel headboard is sure to fit a variety of bedrooms. Dream sweet dreams with the beauty and comfort of the Panel Headboard. Bed frame required (sold separately). 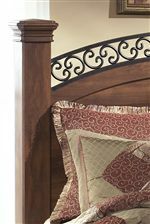 The Timberline Full/Queen Arched Panel Headboard Bed by Signature Design by Ashley at Del Sol Furniture in the Phoenix, Glendale, Tempe, Scottsdale, Avondale, Peoria, Goodyear, Litchfield, Arizona area. Product availability may vary. Contact us for the most current availability on this product.